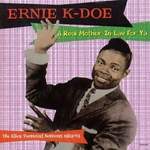 Since his big hit was "Mother-In-Law," a funny song that could easily be perceived as a novelty, Ernest Kador Jr is often dismissed when it comes to the top rank of New Orleans R&B singers. That's an inaccurate assessment, as this delightful compilation proves. Part of the reason, of course, is that these are the Toussaint sessions, and Allen Toussaint is the king of late-'50s and -'60s New Orleans R&B, not only writing classics like "Mother-in-Law," but producing sessions that had precisely the right combination of rolling rhythms, horns, mellow funk, pianos, and warm vocals from the friendly, skilled Ernie K-Doe. He didn't have as rich a selection of material as, say, Fats Domino or Lee Dorsey, but he was at the top tier of the second tier, as this compulsively listenable 29-track collection proves. Stevie Ray Vaughan's second album pretty much did everything a second album should do: it confirmed that the acclaimed debut was no fluke, while matching, if not bettering, the sales of its predecessor, thereby cementing Vaughan's status as a giant of modern blues. US limited edition 'Master Sound' 24kt GOLD 8-track 20-bit 'Super Bit Mapping' audiophile picture CD album, housed in a 12" x 6" book-style artwork stickered longbox with integral fold-out picture insert. This career-spanning box of three CDs and a DVD celebrates a legacy that looms larger than that of any blues-rocking guitarist since Jimi Hendrix. Despite fears that a series of posthumous releases had depleted the Stevie Ray Vaughan vaults, previously unreleased gems dominate the selection. Highlights extend from Vaughan's swaggering apprenticeship with Paul Ray and the Cobras to slash-and-burn concert performances from the final month of his life. There are obligatory dips into the songbooks of Hendrix and Buddy Guy, appearances on MTV Unplugged and Austin City Limits and instrumental interplay with brother Jimmie Vaughan and tour-mate Jeff Beck. Though his guitar never loses its flame-thrower intensity, the set documents his progression from the show-off licks of the young "Stevie Rave On" into a fully rounded artistry of soulful depth.